Of all the american things that I have adopted in my day-to-day life, the one thing that I have accepted with open arms is the “Sunday Brunch” Tradition. What an excellent excuse for sleeping late into mid-morning. Wake up, make lunch that is neither here nor there and call it “Brunch”. One of the things that has become quite common,at my home, for brunch is Chole Batura, the quintessential Punjabi Dish. 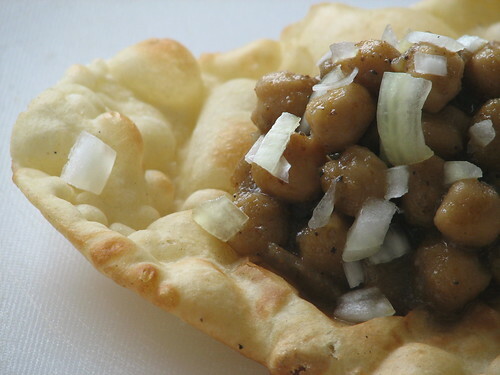 Chole would be curried Garbonzos while Baturas are deep fried breads made with regular flour and yogurt. My friend, who is a punj (Of course! ), once told me that traditionally,chole-batura is an breakfast item served along with sweet lassi. Can you imagine that? “I would probably skip lunch and Dinner with that kind of breakfast!!! !…”, I told her. Of course, this was me in my college days, when chatting up friends over the phone and buying new clothes seemed to fill me up pretty good. Where as, today, I eat this same combination for brunch and end up feeling hungry at 4 pm. I blame it all squarely on the huge hormone fluctuations during pregnancies.Forget the fact that I delivered over 6 months ago and my obstretician told me 2 days ago that all is normal in Vee-land. Well, Doc, you wouldn’t say that if you saw the amount of food I can still gobble up. And what about those pair of jeans that look at me forlornly, whenever I open my closet? Anyway, all that frustration didn’t stop me from enjoying Chole-Bature with Mango Lassi on my patio today. Good Combination. Highly recommended. Add warm water or flour, as required. Knead into a soft pliable dough. Keep aside for about an hour. When ready to make, roll out golf ball sized dough balls into about 2 mm thick rounds and deep fry as described in the recipe for Mangalore Bun. Continue cooking on high heat stirring frequently till the tomatoes break down and the mixture starts leaving oil. Transfer to a food processor and blend into a paste. Transfer back to the Pan.You can make the paste first and then brown it. But I prefer to do it this way. Don’t ask me why. I am weird that way. Ok, I will tell you. Its just that I think this process browns the onion faster. cooked Chickpeas/Garbanzos along with the water. 1 tsp roasted Jeera/Cumin powder. for about an 2-3 hours. Serve 2 ladlefuls of chole topped with 1 tbsp of Tamarind Chutney and 1 tsp finely chopped onion in a bowl per person with 2 baturas and a glass of chilled Mango Lassi.